Stuttgart, Germany – In a warehouse, space is often hard to come by. Forklift drivers frequently have to maneuver their vehicles through tight spaces between shelves and stacked pallets. Time and again, this leads to accidents that result in damage to the goods or the vehicles – a consequence that is not only annoying but can also become quite expensive. A far worse consequence than property damage is personal injury. According to a study by the German employers’ liability insurance association for the wood and metal industries (BGHW), personal injuries occur most often when the vehicle is backing up in a small space of one to three meters. In Germany alone, official reports put the number of accidents involving forklifts at some 12,000 each year (source: WEKA). “A driver’s eyes cannot be everywhere at once – that’s where the Bosch multi-camera system comes in,” says Andrew Allen, responsible for Bosch’s Commercial Vehicle and Off-Road unit. Its forklift camera system will be publicly showcased for the first time at LogiMAT. 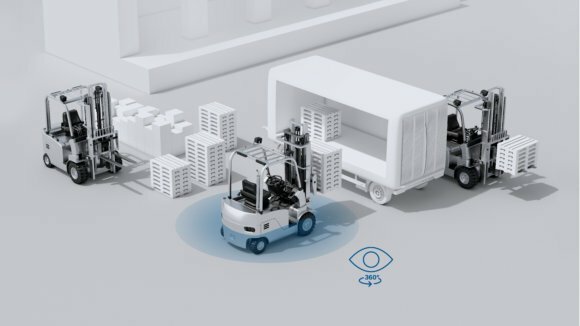 Using the sight assist, the multi-camera system can provide a full 360° view around the forklift – even if it is carrying bulky freight. This simplifies the task of picking up and moving loads, even in tight spaces. The system helps the forklift maneuver with precision and makes it possible to estimate distances more accurately while on the move. Drivers can thus execute logistics tasks simply, safely, and efficiently. The multi-camera system consists of a control unit plus four very compact near-range cameras. Working together, they can capture an area measuring eight by eight meters. The cameras were originally designed for Bosch’s passenger-car segment but have now been adapted for the special needs of the logistics market. Forklift cameras are positioned at the front, rear, and each side of the vehicle. With an aperture of nearly 190°, they capture the vehicle’s entire surroundings. Drivers see a realistic representation of their vehicle as a detailed 3D model on a display. As the vehicle moves, the display adjusts the view of its surroundings in real time. To better suit the vehicle’s purpose, the manufacturer can preconfigure the screen to display individual or 360° views as well as full-screen or split-screen views. The driver then can choose the best view for the task at hand from the preprogrammed options. The multi-camera system can visually project the vehicle’s immediate path over the forward, rear, or top view. To achieve this, the control unit measures the steering angle, calculates the resulting route, and shows it on the display. If the steering angle changes, the system recalculates the route and adapts the display accordingly. The route overlay serves primarily to aid in maneuvering and merging.